Earn up to 2,032 reward points. Get great tone, and show off your love of it. 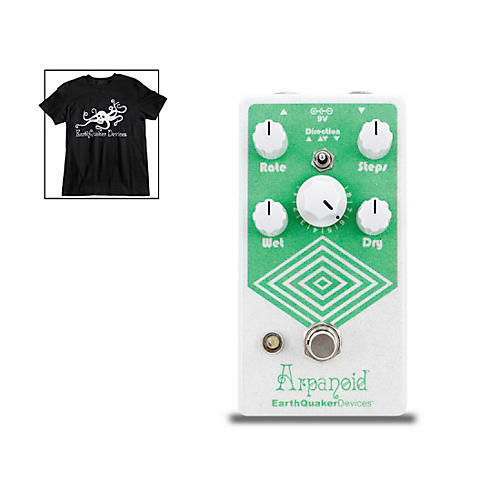 Show off your awesome sound and style with this convenient pedal-and-shirt package. The EarthQuaker Devices Arpanoid V2 is the first dedicated compact polyphonic pitch arpeggiator effects pedal for the electric guitar. The Arpanoid takes whatever notes you play and calculates an adjustable ascending or descending scale based on the root note. It works on complex chords as well as single notes in any key. Its eight modes feature major and minor patterns so your next jazz odyssey will remain on time and in tune. The patterns go from one octave below the input to one octave above, so there’s plenty of harmonic range, and the Arpanoid’s random patterns are sure to be a hit at your next psychedelic freakout. The Arpanoid has a variable Step control to choose the number of notes in the sequence, which determines the rhythm and meter of the pattern, along with the overall feel of the effect. Experimenting with this control will open your third eye to odd time signatures, polyrhythms and a unique quantized hard-sync vibrato effect! Furthermore, the independent Wet and Dry controls allow you to blend the all-analog input signal with the all-digital affected signal, making the Arpanoid useful for anything from subtle ambient tone clusters to a bombastic polyphonic flourish, and the ability to use the Arpanoid fully wet makes it great for use in the studio. The Arpanoid is true-bypass, and built one-at-a-time by a bunch of glowing orbs in the parallel universe of Akron, Ohio.